Student Finance marked my student loan application as approved and my declaration form as received this morning, even though it was in the same envelope as my identity and residence evidence. The student loan process took just under three weeks to complete, and the entire enrolment process took almost exactly a month, even though I had to wait a good while for part-time student loans to open. Since I applied for the loan, a few more dates have filtered to me from the Open University. The module website for TU100 will open on 6 September. The initial shipment of course materials will be shipped out on 9 September. (I’m fairly close to Milton Keynes, so it shouldn’t be more than a couple of days before they arrive.) These materials will include the Senseboard, which is a microcontroller with various inputs and outputs which can be programmed using a drag-and-drop programming environment called Sense. I didn’t realise until today that I could download Sense ahead of time and play around with it. The rest of the materials (books, apparently) will be shipped out on 25 November. I’ll be ripping any DVDs I get so that I can load them onto tablets for easier access. The first group of materials are for use beginning 1 October, which is the module start date. This being distance learning, I don’t know how much that start date matters. My initial hope was to have read through all the initial course material once by the “first day” of the module, so that I can focus my actual studies where they need to go. I haven’t seen how much course material there is, though, but it does seem unlikely I’ll be able to get through it in only two weeks. The second group of materials are for use beginning 17 December. As I don’t reeeaaally think they’re going to have us start on a new block the Friday before Christmas holidays, I suspect that means the materials are really for use beginning the beginning of January. When I look at the six different blocks, I am a bit nervous about how quickly they’re going to move. It’ll be one TMA to the next to the next, and I hope that I can keep up, even though it’s an introductory module. I think my next step is to have some fun playing with Sense. I’m pretty sure that I can use it without the Senseboard to make some terrible games. I’ve also got a hold of a Cisco switch (a Catalyst 3750) which will help with prepping for the CCNA. I’ve managed Ciscos quite a bit, but most organisations I’ve worked for have used Netgear. It’ll be nice to have one in my home lab for testing. The only thing I regret is that I’d rather be taking the modules which are going to replace TU100 next year, TM111 and TM112. Though if they also use the Senseboard, then it’s probably not all that different. Looks like I’ll be paying on the loan (quite heavily) while I’m still on the course, as it takes longer than 4 years to complete. I could pay out of pocket, but would rather just smooth out the rough patches so I only have to worry about one thing at a time. This is a record of my journey from start-to-finish in obtaining my BSc (Hons) Computing & IT degree from Open University. I thought it’d be nice to start with how I ended up on this path. Time will tell how far along it I manage to go. I dropped out of a US high school in the middle of the 11th grade. That’s a year and a half before graduation for those outside the US. (Compulsory education laws can vary state-to-state, and are subject to religious freedoms. Typically, however, it lasts until 16 years of age, even though secondary education lasts to the year students turn 18.) It’s difficult to discuss, but the short version was that I was depressed. My next educational stop was admittance to the ‘local’ community college. (Again, there’s a cultural divide in describing the US education system to some others. An American community college is a public institution of higher education which mainly grants two-year degrees called associate’s degrees, which are primarily a foundation to a four-year bachelor’s degree at a university. They also tend to offer a limited number of bachelor’s degree programmes like universities, or adult education programmes for obtaining diplomas or continuing/further education.) College was great for me emotionally. However, in addition to being expensive, it was also about forty minutes away by car. When I lost my transport, my commute became two 90 minute bus journeys every day, often for a single 30 minute lecture. It ground me down to the point that I eventually quit that, too, and I entered employment. My first job was as telephone support for an online service in the days before the World Wide Web. It was a good education in data communications and paid good money, especially for a drop-out. This led to my next educational stop: distance learning to go back and get my diploma. I was able to do so in short order whilst working, but I despised distance learning at the time. I would buy, collect, or be sent materials, get a sheet of paper telling me what I had to learn, then I showed up for an exam. It was dehumanising, but I was successful. I thought that was going to be the end of my education. I couldn’t make enough money and have enough time to attend university classes, and I certainly wasn’t going to go back to distance learning. I had been enrolled for all of about a week when our lives were forced to change. The immigration laws for the UK were being changed rapidly. Soon, it would be a requirement for my wife to be living in the UK and making around £20,000/year for six months before I could move there. If we left immediately, however, we could use our current earnings as an indication of our earning potential in the UK to prove we wouldn’t need to go on benefits, and we could move together without being separated. I had promised my British wife that we would move to the UK before we had children old enough to go to school, so we had no choice but to pack up our lives, withdraw from University, and move to a different continent. A few years later our son did start school, and I finally had time to enroll at university again. 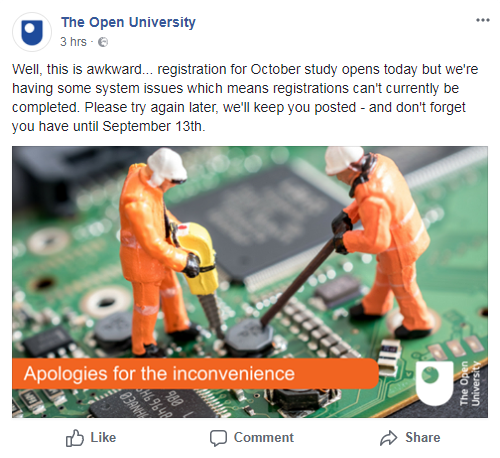 This time I was excited to find Open University. Much more discussion is included in subsequent posts, but the short version is that it’s perfect for my life. My career was already well established over here, even if I was working about 65 hours a week. I was sure I could talk them into giving me a break for study time. Between the time I contacted Open University and the time they called me back, my company went out of business. And didn’t pay me for my last two months of work, taking £6000 of my money with them. At Christmas. I found employment again quickly, but my path back to education was blocked again, just as quickly. This time by good news, though; my wife was pregnant with our second son. He’s still a baby, but we’ve managed to schedule our lives in such a way that I have enough time to finally study a degree at Open University. Time to give it another go. As I already know what I want to do with my life, I’m going to get a degree in my current field. I’m studying for the BSc (Hons) Computing and IT (Q62) degree from Open University. Another entry probably holds more details on why. I suppose the one thing still missing from this entry is why it’s important. It’s not. At least not objectively. I have a great job, make good money, have a home in a great location, am blessed with a truly special family I love to bits … Getting a degree isn’t going to make my life any better. It’s just something that’s of great importance to me personally. Part of it is being an example to my children. Part of it is out of respect to my dad. It’s something that’s been left undone, though. Like my diploma, it’s something I need to go back and finish.